Democrats say balancing the budget with cuts alone is irresponsible, but LePage vows to veto any bill that rolls back those tax breaks. AUGUSTA — Democratic lawmakers and Gov. Paul LePage reached a new impasse Wednesday as Democratic leaders suggested suspending $400 million in Republican-backed income tax cuts to balance Maine’s next two-year budget. Many Democrats voted for the cuts as part of the budget two years ago, but they have long derided the cuts, saying many of them benefit the rich and aren’t offset elsewhere in the budget. But without the cuts, the budget for the two years starting July 1 will face a veto by LePage, for whom the tax reduction was a major policy accomplishment. “If they’re going to raise taxes, yes, they’re looking at a veto,” said Adrienne Bennett, LePage’s spokeswoman. Many legislators see LePage’s proposed budget for the next two years as unacceptable because it would suspend more than $200 million in state revenue sharing to cities and towns. Unless communities cut services, they would have to raise property taxes to offset the loss of revenue. But Republicans find suspension of the income-tax cuts just as unpalatable. 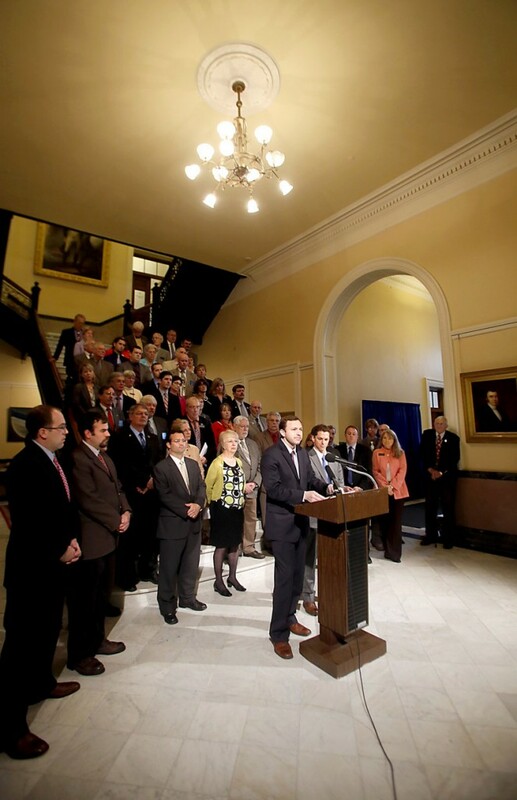 At a news conference Wednesday, House Speaker Mark Eves, D-North Berwick, and Senate President Justin Alfond, D-Portland, made arguments that Democrats have made throughout this legislative session: eliminating revenue sharing would significantly raise property taxes. Suspending the income tax cuts “is the responsible option,” Eves said. Republicans often argue that property tax increases aren’t inevitable if revenue sharing is eliminated because cities and towns could cut spending to make up the difference. The Maine Municipal Association says LePage’s proposed budget, as a whole, would shift a $420 million burden to cities and towns, with $284 million of it in revenue sharing. Republicans panned the Democrats’ plan after the news conference, saying the majority party has made it clear that raising taxes is its only budget solution. “We need to deliver the essential functions of state government, figure out what’s nonessential and make the cuts there,” said Senate Minority Leader Michael Thibodeau, R-Winterport. LePage and the Democrats have had several conflicts over the past two weeks. Last week, LePage, angry after the Senate chair of the Legislature’s Appropriations Committee refused his request to speak to the panel on May 19, accused Democrats of “censorship” and said state department heads wouldn’t testify before the committee anymore. The governor and Democrats also sparred last week over a television screen that was set up outside LePage’s State House office without approval from the legislative committee that oversees the building. Also last week, LePage announced his veto of the Democrats’ plan to expand Medicaid while paying back Maine’s share of hospital debt. The contentious atmosphere was clear Wednesday when Troy Jackson, D-Allagash, the often-outspoken assistant Senate minority leader, shouted over the conversation of Senate Republicans who were addressing reporters while he walked up some stairs. On balance, he said, LePage’s tax cuts and proposed elimination of revenue-sharing are a shift in taxes from the wealthy to all property taxpayers. “That’s all it is!” Jackson yelled. LePage’s income tax cuts aren’t only for the rich. They did cut the rate for the top earners from 8.5 percent to 7.95 percent, but they also moved 70,000 of Maine’s lowest-income people from a 2 percent rate to zero. On balance, Maine’s income tax became more progressive, according to Maine Revenue Services, meaning the rich shoulder a larger percentage of the state’s tax burden. Little mentioned Wednesday were other proposals to solve Maine’s budget problems. A tax-reform proposal by the so-called Gang of 11, for instance, would create a flat, 4 percent income tax rate, broaden the sales tax to almost all goods and services and provide property tax relief. However, the plan looks unlikely to pass. Eves and House Minority Leader Kenneth Fredette, R-Newport, said Friday they oppose it. Many Republicans like the income tax cuts in the proposal but note that it would raise $160 million more in annual tax revenue than the state now takes in. LePage has said that if the plan were revenue-neutral, he could support it. Many Democrats say the tax changes in the plan, particularly the flat income tax and the sales-tax adjustments, are regressive. Assistant Senate Minority Leader Roger Katz, R-Augusta, a leader of the Gang of 11, said he’s confident that the Appropriations committee can craft a “moderate, intelligent compromise” on the budget by the end of June. “My personal hope is that the impasse where we find ourselves creates an opening for the real kind of tax reform that some of us have been advocating for,” he said.